A home is more than just where families come at the end of the day—it is also where children are raised and memories are created. Homeownership is the primary way families of modest means build wealth, which can be passed on to the next generation. In recent years, most mortgages approved for lower wealth families and consumers of color were government-sponsored loans: FHA, VA, and USDA. Were it not for these programs, few consumers of color would know the pride—and realize the financial benefits—of homeownership. If America’s housing market is to truly recover, all credit-worthy borrowers must have access to mortgage credit. When the middle class and housing opportunities grow, families and our nation prosper. 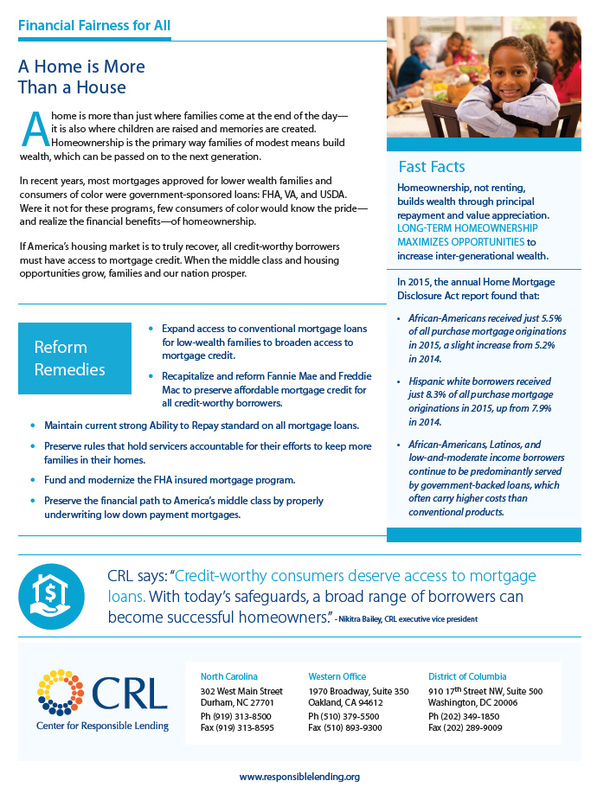 Download the mortgage lending factsheet.